A BankerBag is a high quality, custom designed tote or duffel that features your company’s logo and brand colors. Giving banker bags to clients and high-performing teams is a time-honored tradition in the financial and banking world. Our expert design teams will help you choose from dozens of canvas, trim and color options to create a BankerBag that truly represents your company or organization. A high-visibility decorating option, such as custom woven ribbon featuring your logo in full color, an embroidered logo, or an embossed leather patch are the details that transform a canvas bag into a BankerBag. We use heavyweight, 10- and 18-ounce natural and dyed canvas, and we can also use even heavier 21- and 24-ounce canvas for an additional cost. We provide a range of stock colors, including: natural, tan, black, navy, hunter, burgundy, olive and khaki. If your logo and branding feature unique colors, however, we can also create a Pantone color-matched canvas for an additional cost and a minimum order quantity. The most important aspect of a BankerBag is the message you send when you present it to a client or employee. Your gift is a token of your esteem to commemorate an exciting business deal or a job well done. And the recipients, in turn, will be happy to display your brand whenever they walk out their front door, BankerBag in hand. Bespoke bags are fully custom creations designed specifically for your company’s needs. The description originally comes from bespoke tailoring, the process of creating a unique suit from the material up, rather than tailoring based on an existing design. A bespoke logo bag has long been a traditional gift to mark important occasions like a business or real estate deal, a new product launch, or a significant achievement. The tradition really came into its own with the advent of canvas totes. BankerBags are not something that is just left to sit and gather dust. These bags actually get used, which means that your company name and logo are going to be out there for the world to see. Present a BankerBag instead of a briefcase for an affordable yet stylish option. They’re also great as closing gifts, designed to remind clients and employees alike of the great success of the deal. Present them as gifts to your biggest clients. For as long as bankers have been moving the financial world, they have used gifts to commemorate transactions, encourage and reward outstanding employees and help retain clients. Canvas bags are one of the most traditional, celebrated, and effective types of banking gifts. Their durability and distinctive styling make them very sought after, while their practicality means that your clients use them and enjoy carrying them around. These bags also make great gifts for conference attendees, meeting participants and closing dinners. While many conference gifts are discarded before they even leave the event, everyone will appreciate having a bag to carry the literature they pick up as well as any other gifts they might be given. A canvas tote is a gift that anyone will appreciate, and that they’ll keep and use for years to come. An unprecedented level of customization and design control ensures that your bags will be a perfect representation of your business. Whatever your industry and whatever your event, rely on canvas duffels and totes from BankerBags to help your business achieve success. The hallmark of a BankerBag is its custom woven ribbon, featuring your logo and brand colors stitched to the sturdy webbing handles. Ribbon-trimmed bags are virtually synonymous with style and corporate identity, making them a go-to for companies across every industry. Unlike many gifts, these custom branded duffels and totes are durable and practical. A ribbon tote bag will be appreciated and well used for years to come. Logo ribbon allows for a high degree of customization. First, you can choose to print your logo on the actual ribbon. This method is often the best option because the ribbon is such a distinctive feature. Your logo will stand out, but in a subtle way that will not cause people to shy away from using it. The branding is just strong enough to get noticed. An alternative is to use an embossed leather patch to represent your company. A duffel bag with a logoed leather patch looks distinctive and luxe without being overly promotional. Embossing is a subtle way of branding that fits in very well with the design and styling of the ribbon tote bag. 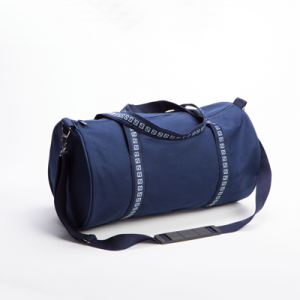 Beyond the decorating options that directly feature your brand, there are numerous additional customization choices available to complete the look of your duffel or tote. Spend a few minutes on Build Your Own BankerBag, our online design tool, to get a feeling for our color and design options. Or contact us directly, and we will help you get started with a design solution that will serve your company for years to come.